A construction site can be a difficult and dangerous place to work. A good emergency plan will help people take quick and effective action in the event of an emergency. It will help in easing the severity of the situation and limit the consequences. An emergency response plan establishes an organization’s procedures and structures for response to emergencies. The response plan provides a strategy to combat any emergency. It assigns and responsibilities for implementation of the plan during an emergency. Being organized is the key to success in the construction business. The other important element for long-term success in this business is to have a risk management solution for any contingency that may occur at the construction site. When disaster strikes due to an act of nature, an accident, or a deliberate act, being prepared will help mitigate losses. An emergency response plan will enable you to get your operations back on track quickly. The emergency plan is not just important for the construction site. The emergency action plan will make a big difference when you get quotes for builder’s risk insurance and construction liability insurance. So, how does one begin to develop a construction site emergency plan? The emergency response planning for construction starts with making a list of all internal personnel who work for the company. The list will include the duties they will handle if there is an emergency on a construction site. Names, areas of responsibility, and contact numbers of each individual should be included in the list. The construction site should be mapped. This will help in clearly defining the emergency evacuation routes. The map should include the location of fire extinguishers, medical first aid kits, and assembly points that the employees working at the construction site should use. Every individual on the construction site should be familiar with at least two evacuation routes. Awareness about two or more evacuation routes is beneficial, of course, because at least one route may be unusable during an emergency. Chemical spills are dangerous if they are not immediately contained. The designated emergency coordinator should be notified. The site should be secured. The spill should be cleaned only by trained personnel. Proper equipment should be used for the cleaning process. If trained personnel are not available, use a professional chemical spill cleanup company. Provide clear guidance about what should be done in case of a medical emergency. The paramedics should be given vital information about the nature of the emergency and the exact location of the response. Employees should be given first aid and CPR training. Weather can affect the construction business in a big way. Floods, earthquakes, hurricanes, and tornadoes have the potential to affect your business. Good emergency plan policies and procedures will help in dealing with severe weather. Activate the fire alarm and call for emergency assistance if there is a fire. Notify the fire department before you start fighting the fire.If the fire is small and not spreading, you should use proper equipment to fight the fire. Proper evacuation procedures should be followed. Bridges, towers, and scaffolding are common structures at construction sites. Accidents involving these structures can be serious and often life threatening. All structures should be listed, and the emergency action plan should be developed for each structure. Employees working around the structures should be familiar with the procedures of the response plan. Extended power loss is not necessarily an immediate threat to your team, but it can be damaging to the equipment used at construction sites.Switch off the appliances to prevent a surge of power when it is restored. Turn off power and drain water lines in areas with freezing temperatures. Though bomb threats seem rare, it is always important to plan for the unexpected. You should have a plan in place so that you can deal with such an event immediately that should include an evacuation plan and notifying the authorities. Untrained employees not only endanger themselves but can affect the rescue of others. The rescue plan should always be implemented by trained personnel.If the construction site operations take place in confined spaces, you should have an emergency action plan that includes rescue procedures in the confined spaces. If the construction company doesn’t have a formal medical program, it should think of ways to provide medical and first aid services onsite. If medical facilities are available near the construction site, arrangements should be made so that they are able to handle any emergency at short notice. A written emergency medical procedure should be provided to all employees before their work begins. This will help avoid confusion in the event of an emergency. If a hospital or clinic is not near the construction site, it is even more important for on-site personnel to have received adequate training in first aid. The plan for workplace emergencies should include a way to alert employees. The plan should include how to report emergencies, how to evacuate and take other measures. Alarms should be distinctive and recognized by all employees. An emergency communication system to contact the law enforcement officers and fire department should be available. Nothing prepares you for an emergency like training. All employees at the construction site should be trained, preparing them for any eventuality. The builders risk insurance premiums will also be less if the employees are trained in handling emergencies. Do you work with hazardous substances? An emergency involving hazardous substances is a possibility at many construction sites. Emergencies involving hazardous substances include biological, corrosive, explosive, flammable, noxious, oxidizable, toxic or radioactive substances. The source of the hazardous substances could be external or internal. Irrespective of the source, you should remember that it will have a direct impact on your employees. The risk of an emergency increases substantially if the construction site stores or uses hazardous substances. This possibility should be addressed in the construction site emergency plan. The OSHA Hazard Communication Standard requires employers who work with hazardous substances to inventory them. The Medical Safety Data Sheets should be kept in a place that is accessible to all employees. Employees should be trained to protect themselves from these hazardous substances. How often do you plan to train/update plan? Develop or update the initial plan. Introduce new processes, equipment, and materials in the workplace that affect the evacuation routes. Change the design or layout of the facility. Update or revise the emergency procedures. Are you equipped with any necessary emergency/medical equipment? The employees will need personal protective equipment during an evacuation. The equipment is chosen based on the potential hazard at the construction site. Face shield, goggles, safety glasses for eye protection. Hard hats for head protection. Hard shoes for foot protection. 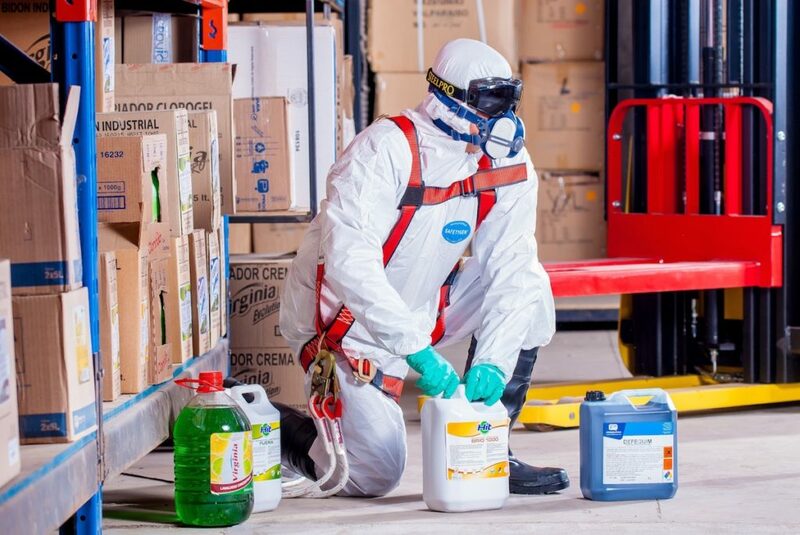 Chemical suits, hoods, gloves, and boots for protection from spills. Special body protection for extreme temperatures. Any other special warning devices or equipment that are necessary for hazards that are unique to the construction site. The key requirements that mitigate the risk of emergency are found in OSHA sections of standard for the construction industry. The standard codes list all the standards that apply to different types of emergencies. Additional standards may also apply depending on the work performed at the construction site. The standard codes will help reduce the risk of emergency at the worksite. The OSHA training and templates are resources that you will be able to use to develop a construction site emergency plan. Even though no organization expects a disaster or emergency, especially one that affects their employees, it is best to be prepared. The OSHA training is designed to help you face any emergency. Apart from an emergency response plan, you should secure your business against uncertainty. You can be prepared with help from Allied Insurance. Allied Insurance will help protect your construction company with liability and risk insurance. Contact Allied Insurance today to learn more about how you can protect your construction company before, during, and after any emergency.